Virginia Commonwealth Rams guard Rob Brandenberg (11) dribbles the ball as Wofford Terriers guard Karl Cochran (2) defends in the second half at Stuart C. Siegel Center. Ohio native and VCU senior guard Rob Brandenberg joined the 1,000-point club for his career last weekend as the Rams rolled to victory over in-state rival Virginia Tech. The 6’2 Brandenberg averaged 14 minutes a game as a freshman backup for VCU’s final four team in 2011. He’s been a starter since midway through his sophomore season and averaged a career-best 10.4 points per game last season. He’s the 33rd player in VCU history to score 1,000 points in his career. Brandenberg grew up in Cincinnati and lists Cincinnati as his hometown. He went to high school at Gahanna Lincoln near Columbus, and in his senior year the Rams upset Jared Sullinger-led Columbus Northland to win a Div. I regional title and advance to the state tournament. He was the first player to commit to coach Shaka Smart after Smart took over at VCU in 2010. 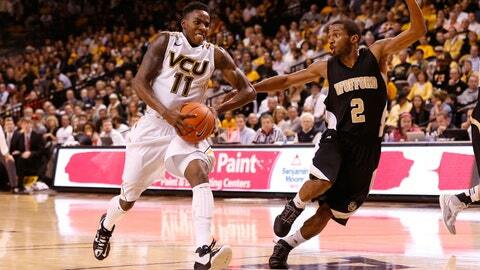 VCU (10-3) returns to action Dec. 28 vs. Boston College in Brooklyn; that game will air on FOX Sports 1. The Rams play at Dayton on Jan. 22.